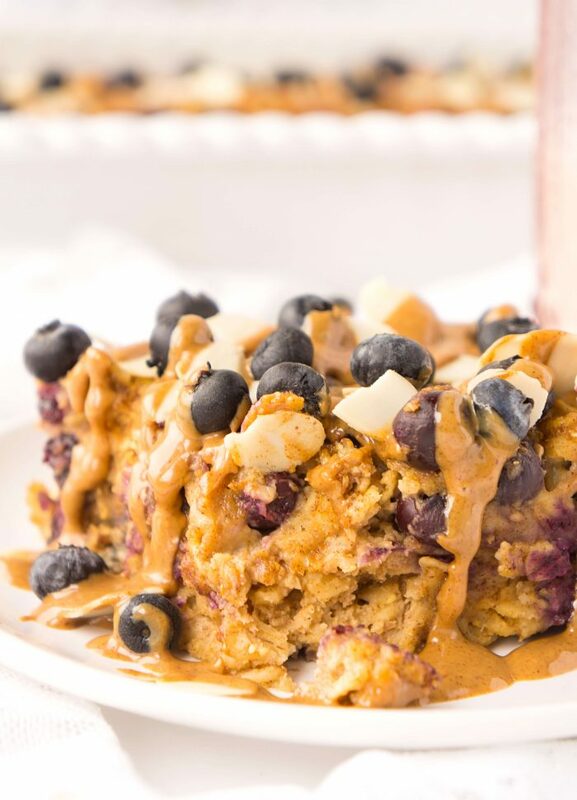 These days, we are all about the baked oatmeal. While I always enjoyed the concept of baked oatmeal, I never thought to make it all that much in the past….that is, until our little guy started on solids. Then, suddenly, the baked oatmeal became the go-to breakfast recipe in our house. It’s seriously a life saver. 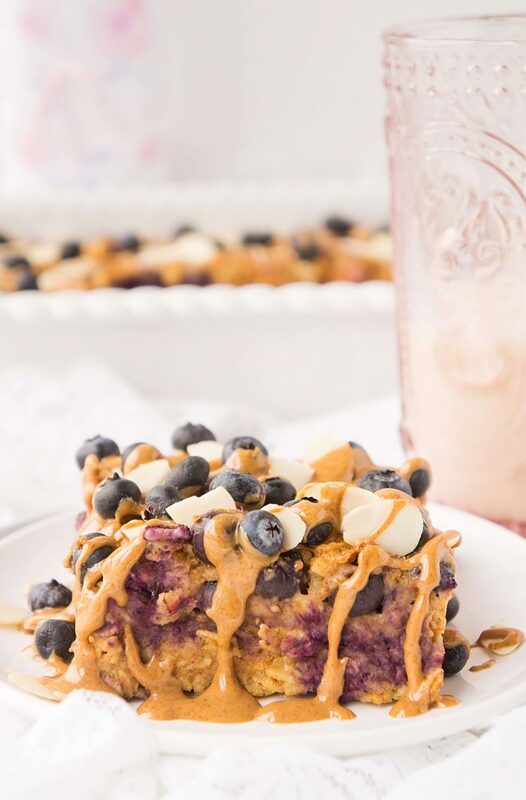 We started off with this Peanut Butter Banana Baked Oatmeal and he loved it so much that I decided to experiment with another flavour to switch things up a bit. 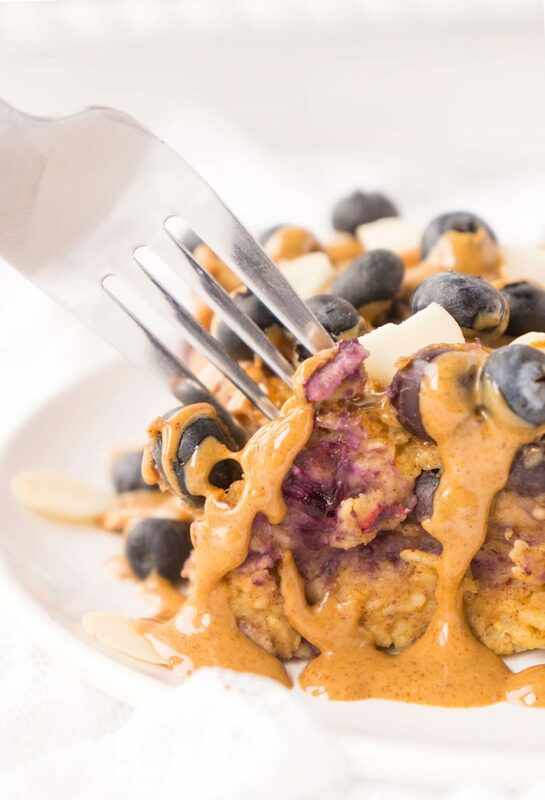 This time around, it was this Blueberry Almond Baked Oatmeal. 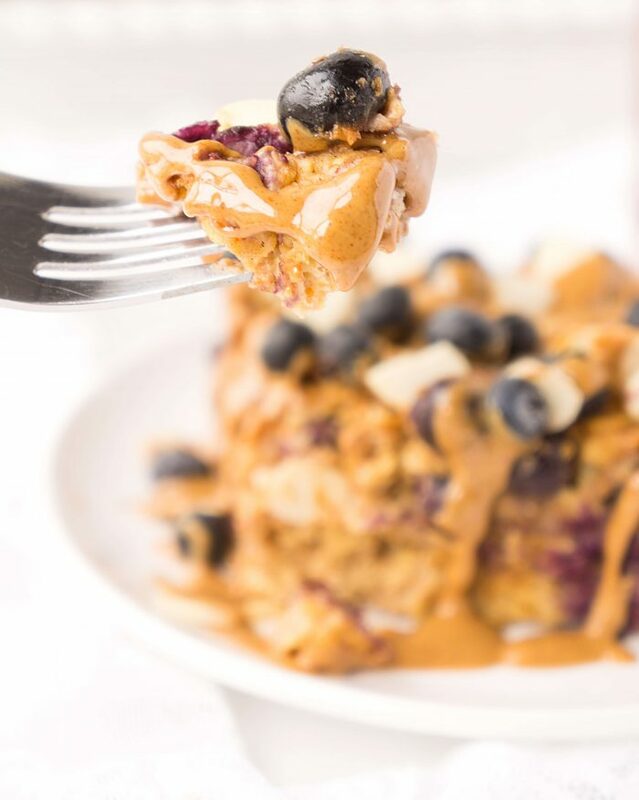 Think juicy blueberries and flavours of almond butter in every single bite. It’s actually pretty amazing because you can make up a batch for the week and it’s something that the whole family can enjoy with pretty much no work required. 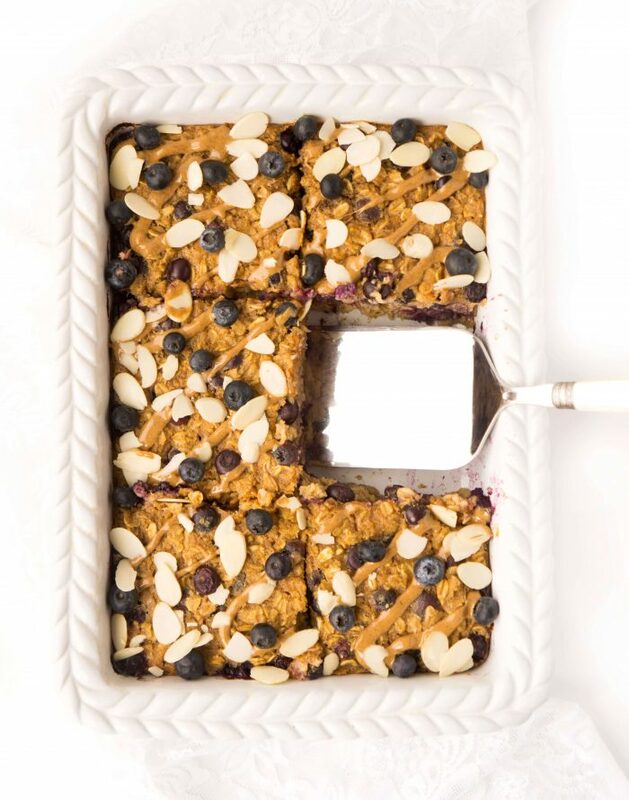 Other than maybe cutting a slice and topping with some extra berries, sliced almonds and a drizzle of almond butter. But to me, that’s not work. That’s just fun! Because at the end of the day, you know that all of those flavours will create this fun little party in your mouth. 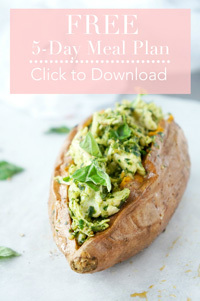 So this recipe takes literally no time at all to prepare which is one of the reasons why I LOVE it so much. First, you’ll need to preheat the oven to 350 degrees F. Grease a 8×8 inch square or 7×5 inch rectangular baking dish. Next, mix all of the dry ingredients in a large bowl. Add the wet ingredients to the bowl and stir to combine. Add the blueberries and fold into the mixture. Bake for 35-40 minutes or until inserted toothpick comes out clean. Top with all the things. So really, you can bake the oatmeal up and serve it as is, and it still tastes amazing. OR you can add some additional toppings to spruce it up even further! Those would be my top three picks but feel free to get creative and add whatever you prefer! You can store this baked oatmeal in the fridge for up to a week in the baking pan covered with saran wrap or in an air-tight container. Beyond that, I would recommend storing it in the freezer for up to three months. Simply defrost by leaving in the fridge overnight or warm it up in the microwave. 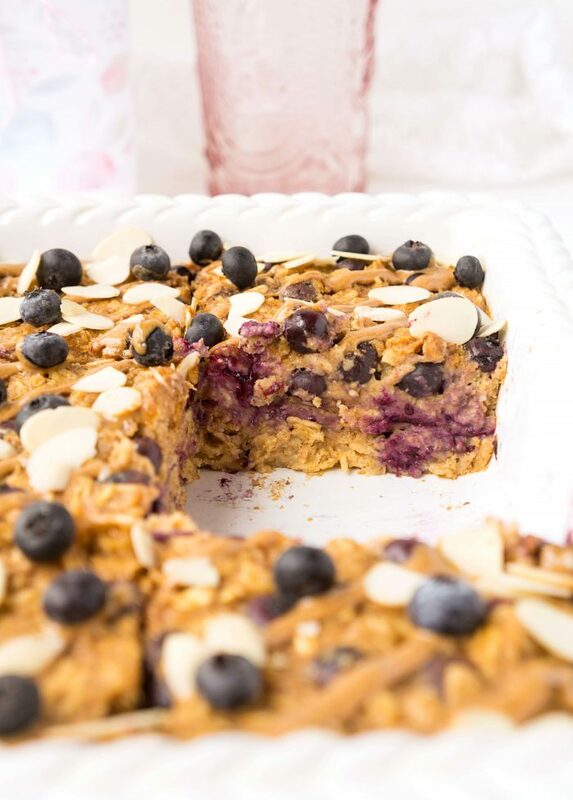 What makes Blueberry Almond Baked Oatmeal a healthy option? Let’s take a closer look at some of the key ingredients! Rolled oats – oats contain both soluble and insoluble fibre which can help lower cholesterol and stabilize blood sugar levels, while also keeping you feeling full for longer. Not to mention, they can also improve your digestive health and keep you regular! Blueberries – are jam-packed with antioxidants and phytochemicals that may help prevent and slow the progression of chronic disease and aging. Sign me up! Almond Butter – contains healthy fats which can help lower cholesterol and improve overall heart health. The extra dose of protein and fat also keeps you feeling full for longer! Applesauce – acts as a natural sweetener so less added sugar is required. If you wish to avoid the added sugar in this recipe altogether, don’t add the quarter cup of maple syrup, and instead add one cup total unsweetened applesauce. Seriously, can you go wrong with all of that goodness?! Preheat oven to 350 degrees F. Grease an 8x8 inch square or 7x5 inch rectangular baking dish. Next, add milk, applesauce, maple syrup, eggs, vanilla, and almond butter. Stir to combine. 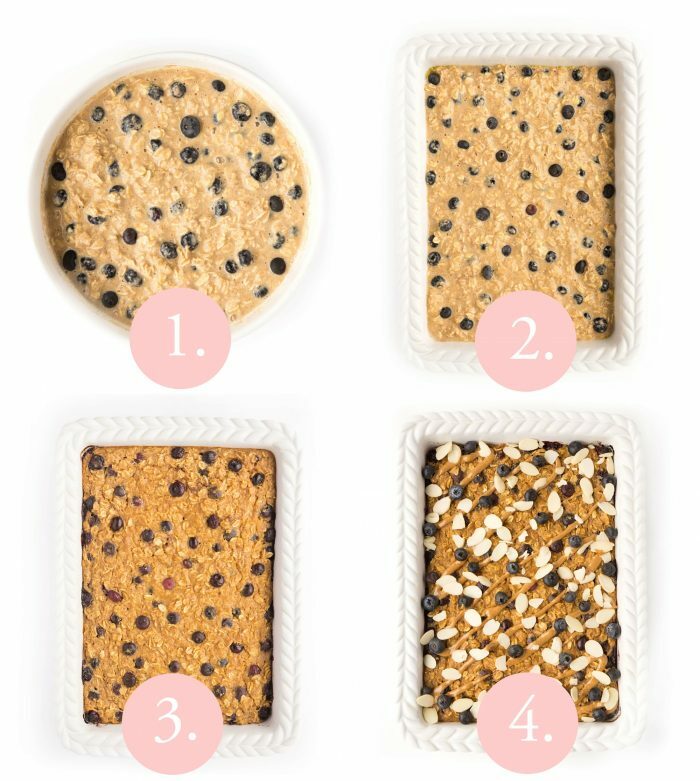 Pour the oatmeal mixture into the greased baking dish and distribute evenly with a spatula. Place in oven and bake for 35-40 minutes or until inserted toothpick comes out clean. 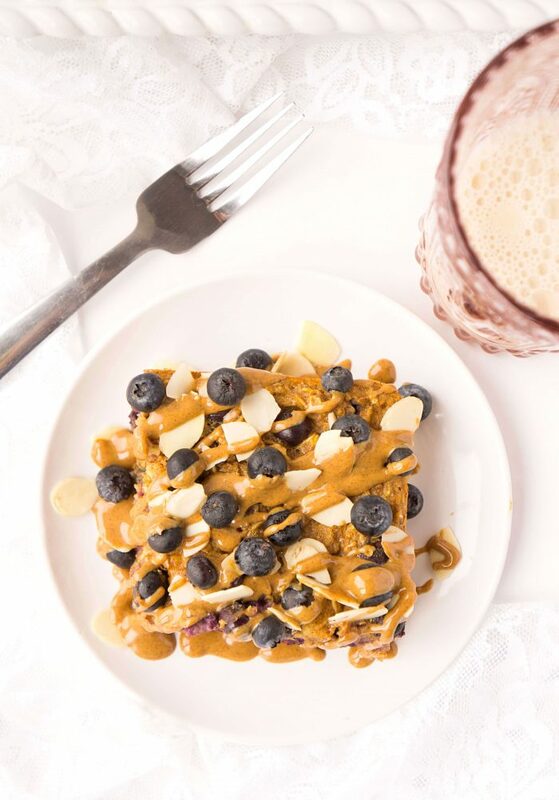 To serve, top with a drizzle of almond butter, fresh blueberries and sliced almonds, if desired. * If you wish to make this recipe with no sugar added, don't add the quarter cup of maple syrup, and instead add one cup total unsweetened applesauce. This is especially recommended if serving to babies. ** If serving to babies, I recommend not adding the sliced almonds on top of the baked oatmeal. If you have a chance to try out this Blueberry Almond Baked Oatmeal, I’d love to see your pics! Tag me on instagram @hauteandhealthyliving and use the hashtag #hauteandhealthy!